Each site’s program will begin with a legislative breakfast mixer. 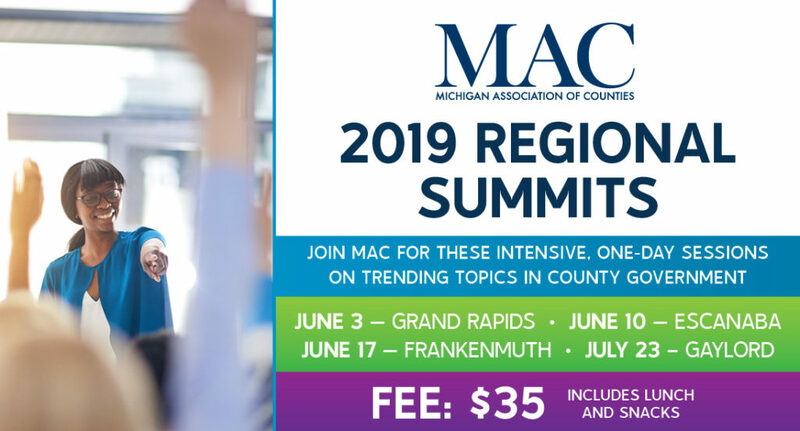 MAC is inviting legislators from the region surrounding each site to foster relationships with their county counterparts. The summit will run from 8:30 a.m. to 2:30 p.m.; a light breakfast and lunch will be included for the $35 fee. Energy company Enbridge will make a special presentation during lunch at the June 10 Regional Summit in Escanaba, focusing on the company’s proposed tunnel project under the Straits of Mackinac and upcoming work throughout Michigan. In 2017, 35 of Michigan’s 83 counties received approximately $60 million in property taxes from Enbridge. Space is limited at some sites, so please reserve your slot today!